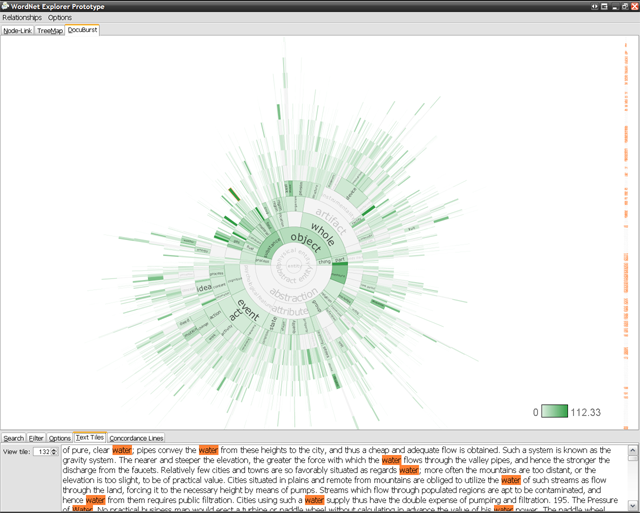 DocuBurst is the first visualization of document content which takes advantage of the human-created structure in lexical databases. 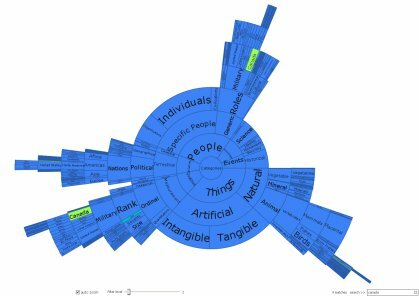 We use an accepted design paradigm to generate visualizations which improve the usability and utility of WordNet as the backbone for document content visualization. 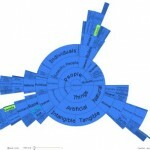 A radial, space-filling layout of hyponymy (IS-A relation) is presented with interactive techniques of zoom, filter, and details-on-demand for the task of document visualization. The techniques can be generalized to multiple documents. C. Collins, S. Carpendale, and G. Penn, “DocuBurst: Visualizing Document Content Using Language Structure,” Computer Graphics Forum (Proc. 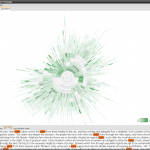 of the Eurographics/IEEE-VGTC Symposium on Visualization (EuroVis)), vol. 28, iss. 3, pp. 1039-1046, 2009. A feature story on DocuBurst aired on FairChild TV “Media Focus” (cable 36 in Toronto), Friday, March 14, 2008!